Fourteen (14) states currently administer programs to promote Veteran and Disabled Veteran Small Businesses. Vetrepreneurs that are focused exclusively on the federal government may be missing out on opportunities with their state government. This is particularly true for states that promote (i.e. provide advantageous contracting considerations) to veteran and disabled veteran small businesses. Note: Total state spends exceed Federal non-mandatory annual spend. 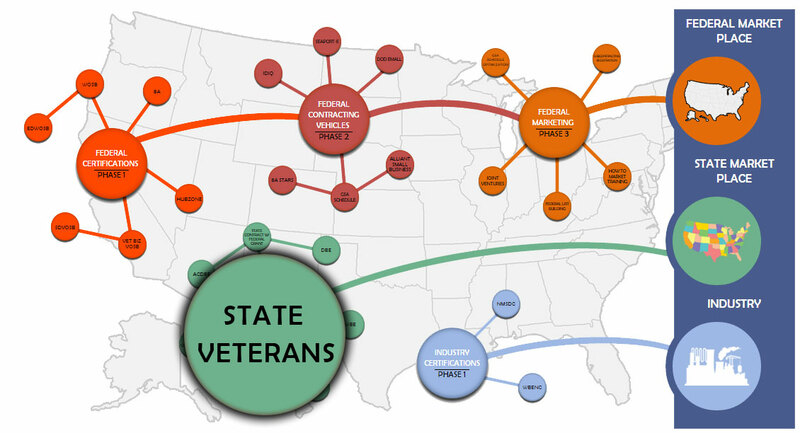 The existence and advantages of Veteran business programs has grown significantly during the past 10 years and is anticipated to experience continued growth as state legislatures attempt to provide opportunities for returning Veterans. The advantages of participating in programs vary by state. The most advantages programs include set-asides and/or procurement preferences to the Veteran or Disabled Veteran owned business. Ea8a monitors these programs and provides the following State benefits matrix for the educational use of prospective clients and current clients. *Arkansas MBE - Service Disabled Veterans are included into the Minority Business Enterprise program. Award at least 5% of state contracts to Service Disabled Veteran Owned Businesses. Includes the use of Set-asides to achieve goal. FYI: California led the way with the nation’s first program to promote veteran and disabled veterans. Award at least 3% of state contracts awarded to DVBE companies using various tools including the “SB/DVBE Option" (aka set-aside) when contracting for goods, services, information technology and public works projects (for actions valued at $5-$250K and requires at least two quotes from DVBE companies). Florida VBE & SDVBE - Veteran Business Enterprise & Service-Disabled Veteran Business Enterprise Programs State agencies, when considering two or more bids/ proposals for commodities/services, that are equal with respect to all relevant considerations, including price, quality, and service, award shall be made to the SDVBE or VBE company. Minor advantage. Illinois VBP - Veterans Business Program State agencies and universities are encouraged to spend at least 3% of their procurement budgets with certified Veteran-owned businesses. Indiana VBE - Veterans Business Enterprise Program Award at least 3% of state contracts to veteran-owned small businesses (does not include public works requirements). Solicitation preparation and bid evaluations designed to achieve goal. New York VCP - Veterans Contract Program Award 6% of state contracts to SDVOSB companies using several tools including set-asides. Maryland VOSB & SDVOSB – Veteran Owned Small Businesses and Service Disabled Veteran Owned Small Business Programs Very advantageous. VOSB and SDVOSB receive procurement preferences of 2% and 3% (in addition to another 5%, if a small business). So, if a non-preference business is the lowest bid a SDVOSB would still be awarded the contract provided that its bid does not exceed the low bid by more than 8%. Massachusetts SDVOBE – Service Disabled Veteran Owned Business Enterprise Program Permits Federally (VA certified) SDVOSBs to participate in MA’s Supplier Diversity Program (SDP). Contracts valued above $150K are reviewed to maximize SDP participations (as Primes and Subs). Benchmark for SDVOSB is 3% of annual spend. Michigan QDV- Qualified Disabled Veterans Program Service disabled veterans get up to a 10% procurement preference on State contracts. Goal of 5% of state contracts to service-disabled veteran-owned companies. 2) MnDOT’s Veterans Business Program 1) Veteran-owned small businesses may receive up to 6% procurement preference when responding to solicitations issued by state agencies (preference is applied to the first $500,000 of the response). 2) Veterans or service-disabled veterans receive evaluation preference for any state funded highway construction project (6% of bid value not to exceed $60,000). *Virginia SWaM – Service disabled veterans receive special eligibility to participate in Virginia’s SWaM program. Award 40% of state contracts to SWaM certified companies. Set-aside program exists to support goal. SWaM also includes minority and woman businesses. Oregon DVB - Disabled Veteran Business Program An agency may require a contractor to subcontract some part of a contract to a business enterprise that is owned or controlled by a disabled veteran. Minor advantage. Washington VOBP - Certified Veteran or Servicemember Owned Business Program State agencies are encouraged to award 5% of their contracts from Veteran or Servicemember Owned Businesses. Wisconsin DVOB - Disabled Veterans Owned Business Program Disabled veteran-owned businesses are eligible for a 5% procurement preference on state purchases. *Arkansas and Virginia permit service disabled veterans to participate in their Minority business programs, which is a more complex application process as compared to a unique veteran business program application. Note: Program information last reviewed during September 2014. Please notify Mike Ryan (miker@ez8a.com) of any discrepancies in the presented information. While the eligibility criteria are typically similar to those used to determine eligibility for the Veteran Administration’s (VA) Veteran First Program (includes Veteran-Owned and Service Disabled Veteran Owned Small Businesses), each states has its own application process that is unique. The common criteria include. A service connected disability (the minimum disability percentage varies by program). Must be wholly owned by one or more disabled veterans. Veteran owner(s) reside in the state and the company is physically located in that state or the U.S.
Management and daily operations must be exercised by the veteran ownership member(s). Entire copy of Federal Income Tax Returns for the business for the most recent three (3) years. Resume(s) for Disabled Veterans (education, knowledge, and qualifications). Stock Transfer Ledger and Stock Certificates. *Additional documentation may be required as needed to support proof of domicile, or address business ownership (e.g. business and/or personal bank signature cards, or bank statement, or an audited business income statement. An extensive range of additional documents may be required. These two states permit veteran business participation in their minority business programs. Arkansas’ MBE (Minority Business Enterprise). Virginia SWaM (Small, Women-owned, and Minority –owned businesses. A reduction in the application fees for these programs is offered when purchased in combination with the CVE’s VOSB/SDVOSB application.